September 5, 2018 – Looking for something fun (and free) to do with the kids? Want to expand your creative horizons or try a new hobby before you spend money on equipment? 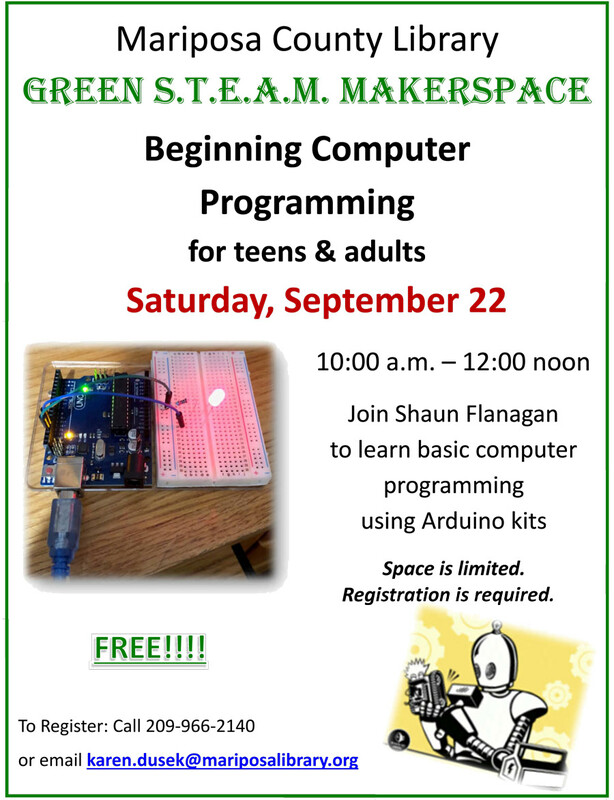 The Mariposa Library’s Green S.T.E.A.M. Makerspace program is for you. The program offers free workshops on a variety of topics based on the overriding theme of sustainability and incorporating the elements of S.T.E.A.M. (science, technology, engineering, art and math). Equipment, tools and most materials are provided at no cost. 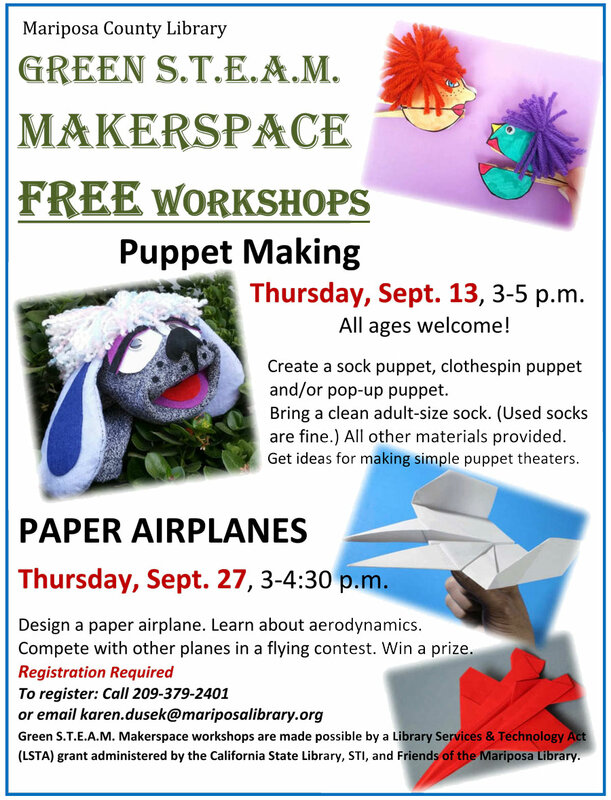 Puppet Making (all ages), Thursday, September 13 from 3:00 P.M. to 5:00 P.M.
Paper airplanes (all ages), Thursday, September 27 from 3:00 P.M. to 4:30 P.M. In the puppet making workshop, participants will make a sock puppet, pop-up puppet and/or clothespin puppet and get ideas for making some simple puppet theaters. Everyone should bring a clean adult-size sock. Used socks are fine. All other materials will be provided. After designing an aircraft in the paper airplane workshop, everyone will compete in a race to see whose planes fly fastest, furthest, highest and craziest. Winners and runners-up will receive a coupon for an ice cream cone. Registration is required for all workshops. To register call 209-966-2140 or email karen.dusek@mariposalibrary.org. For more information about these and other Library programs go to MariposaLibrary.org or visit Mariposa Library on Facebook. Green S.T.E.A.M. Makerspace workshops are made possible by a Library Services & Technology Act (LSTA) grant administered by the California State Library, STI, and Friends of the Mariposa Library. AB’den sosyal medya devlerini üzecek telif kararı!